For this Wednesday’s bloggers’ round-up, I’ve chosen Kathy Stanford‘s description of the highly original international garden festival at the château of Chaumont-sur-Loire, Denise from Bolton‘s visit to the Chantilly race course, which definitely seems a worthwhile excursion and Bread is Pain‘s very amusing story of an elderly woman jumping the queue at the Orsay Museum. The Domaine de Chaumont-sur-Loire covers an area of approximately 32 hectares and is located between Blois and Tours in the Loire Valley. The Domaine de Chaumont-sur-Loire is the foremost Centre for Art and Nature entirely devoted to the relationship between nature and culture, artistic creation and the impact of landscape, our heritage and contemporary art. Chantilly racecourse is in a lovely setting, with the châteaux on one side, the forest in the distance. 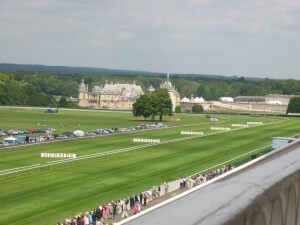 Even if you are not into racing it is a pleasant place to have a picnic, and the chateaux is worth a visit too. 20minutes on the train from Gare du Nord, it makes a nice day out. On a previous trip I watched an interesting dressage show in the famous Grades Ecuries, which legend has it, was commisioned to be built like a palaceby Henry, Duc de Bourbon, Prince of Conde, because he thought he would be reincarnated horse. by Bread is Pain, a 30-something American living in the Rhone-Alps, and slowly eating and drinking herself through the country. This entry was posted in French customs, Loire Valley, Paris, Restaurants, Sightseeing and tagged Bread is Pain, Chantilly races, Chaumont-sur-Loire, Denise from Bolton, femmes francophiles. Bookmark the permalink. Oh what a surprise! I logged on to thank you for your hospitality and found my blogpost! I feel very honoured. I am just an amateur blogger! Loved the breakfast. Thanks for inviting me and hosting it despite not getting home till 3am! Hi Denise, it was lovely to meet a new blogger! And I really liked your post on Chantilly. I have put it on my list. I’m seriously thinking of cultivating the queue jumping in my dotage. Despite my Australian background, I had never noticed the old lady queue jumping but I guess that after living here for 37 years, I had got used to it! Some queue jumping is seriously frowned on (in a shop or at the market) whereas it doesn’t seem to matter when you’re taking a bus or standing in line for an exhibition. Not to mention the sales which are a free-for-all. Thanks so much for including my post in this weeks blog round-up. I really enjoy discovering new blogs. It was great to meet Denise at the bloggers’ breakfast you organised on Monday. You’re very welcome. 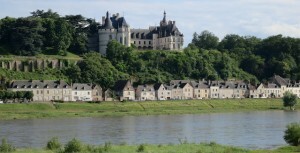 I’ve posted the link on the Loire ConneXion FB community.